Facebook, representing pregnant moms, new moms and would-be-moms, we have a few things we'd like to use the thumbs-down button for. Here they are in GIFs. You're about to get a new form of entertainment for your 2 a.m. feedings. Mark Zuckerburg, CEO of Facebook, revealed during a town hall Q&A at the company's headquarters on Tuesday that they're rolling out some kind of dislike button. Though the company has been hesitant to let people hate on a status or update, they've decided to give people the option to express sympathy or voice their opinion with this new button, which will roll out gradually over the next months. "If you're sharing something that is sad, whether it's something in current events, like the refugee crisis, or if a family member passed away, then it may not feel comfortable to 'like' that post," Zuckerberg explained. "But your friends want to be able to express that they understand and relate to you, so I do think it's important to give people more options than just 'like' as a quick way to emote and share what they're feeling on a post." 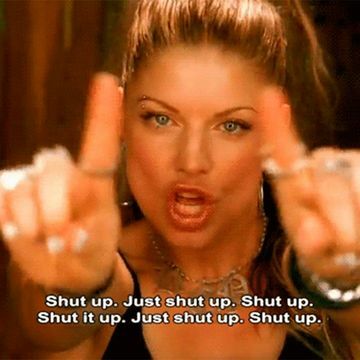 When people have an opinion about how fast—or how much—baby weight you're 'supposed' to lose. When someone goes on a rant about how it's not cool for women to breastfeed in public. When you're 8 months pregnant, terribly uncomfortable and someone writes on your wall that you look like you're going to pop. When a friend posts a passive-aggressive status about how 'new moms don't have time for their friends.' I'm sorry, how much sleep did YOU get last night? When a mom from the playground posts about how she makes all of her baby food from scratch and that's the only way to go. When anyone writes about how they had 'too much sleep' last night and are too tired to make it to brunch. When you post a picture of your baby and someone gives you parenting advice on how you're doing the whole mom thing wrong. When someone shares an infographic to show how 'unhealthy' formula feeding is... and you can't nurse. When someone shares a #IWokeUpLikeThis photo... with a full face of makeup and a blowout. Mmmhmm.